Strong bullish moves over a long period have created great momentum, bearish continuation patterns are now present. Patterns are a common occurrence in technical analysis. There are many financial experts who believe that patterns are basically some type of voodoo magic. There are other financial experts who believe that patterns exist only because humans want to see them. While there are varied rules and conditions to identify patterns, there are also some conditions that are nearly constant. Flags and Pennants are two of the most common and most powerful and repeating patterns in all of technical analysis. They have extremely high probabilities of operating and fulfilling their stated purpose. They are prime examples of what we call continuation patterns. Continuation Patterns are patterns that will continue to trade in the direction of the overall trend. They are labeled Bull Flags, Bear Flags, Bullish Pennants, and Bearish Pennants. Bull and Bear flags are parallel channels that move in the opposite direction of the primary trend. And just like flags, Bull and Bear pennants move in the opposite direction of the primary trend, but pennants form triangles. Both of these patterns create what we know as pullbacks (or throwbacks). Bitcoin has been trading inside one of these patterns since the beginning of 2019. 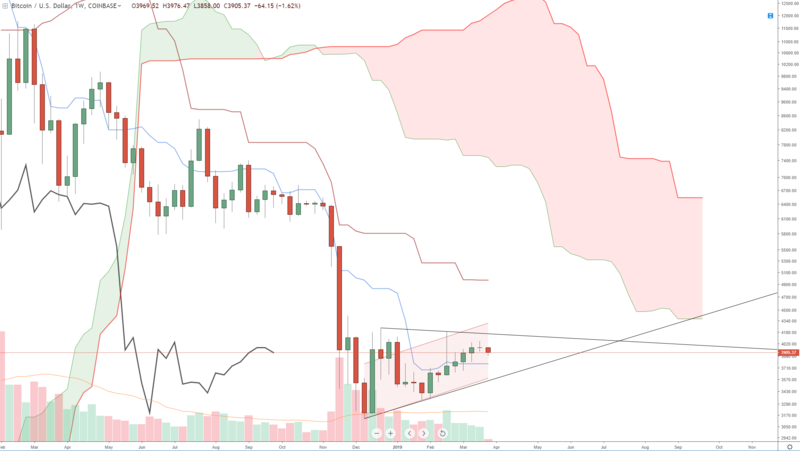 Bitcoin’s weekly chart shows it trading in a upwards moving channel – a Bear Flag. However, one could also draw trendlines from the two highs and two lows which create a triangle, or a Bearish Pennant. There are two conditions that have occurred that could result in a couple of weeks of Bitcoin dropping. First, is the Gann 49-day cycle. Gann called this the ‘Death Zone’. The number 7 is an extremely important number in Gann analysis. 7-weeks equals 7 x 7days which equals 49. This same number is also within Gann’s 45-day cycle. When price has moved straight up or down for a period of 7 weeks, we often see quick and violent trend reversals. These reversals can be long or short term in the length. The current chart for Bitcoin shows that a move lower could extend all the way down to 3587 before any support is found. That price level is the bottom of the upper trend line as well as the bottom of the bear flag channel. However, there could be an extremely powerful move lower. One of the key re-entry strategies in the Ichimoku system is to re-enter the short trade once price moves back below the Conversion Line (blue line). This generally initiates another prolonged leg lower. This would occur if price moves and closes below 3750. To have a bullish bias over the long term, Bitcoin would need to trade in a very specific manner. First, we would want to see price drop down to 3750 to test that extremely important weekly Conversion Line. If price does find support on the weekly conversion line, then we’ll have evidence of a new, long term bull trend. But ultimately, Bitcoin needs to trade above the downtrend line as well as the upper band of the bear flag. For those conditions to happen, Bitcoin needs to trade above 4250 – a level that becomes easier to reach every day.